Returns a random variate from a Cauchy distribution. is the seed value. A new value for seed is returned each time CALL RANCAU is executed. 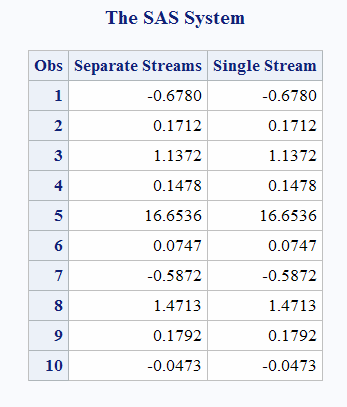 is a numeric SAS variable. A new value for the random variate x is returned each time CALL RANCAU is executed. 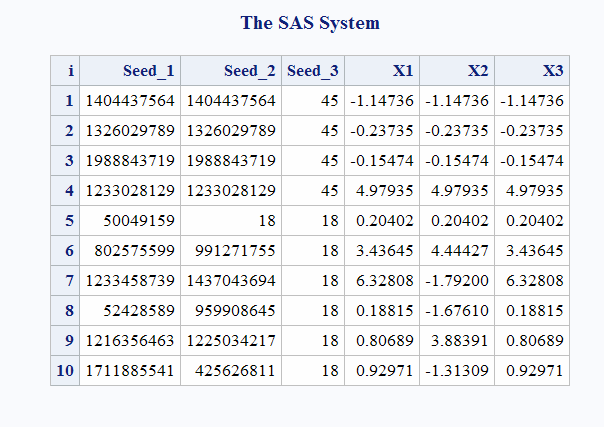 The CALL RANCAU routine updates seed and returns a variate x that is generated from a Cauchy distribution that has a location parameter of 0 and scale parameter of 1. An acceptance-rejection procedure applied to RANUNI uniform variates is used. If u and v are independent uniform (−1/2, 1/2) variables and u2+v2 ≤ 1/4, then u/v is a Cauchy variate. The CALL RANCAU routine gives greater control of the seed and random number streams than does the RANCAU function. This example uses the CALL RANCAU routine.